Dogs love to get into trouble but unfortunately for them, there isn’t a very strong “poker face” game going on when they get caught. Whether it’s messing with the cat, tearing apart your favorite pair of shoes, or just getting into general mischief, it’s hard to stay mad at them when they look so darn cute when caught. We combed the internet for some of the funniest “caught in the act” moments from dogs and they don’t disappoint. Check out our favorites and try not to laugh. The look of pure guilt. 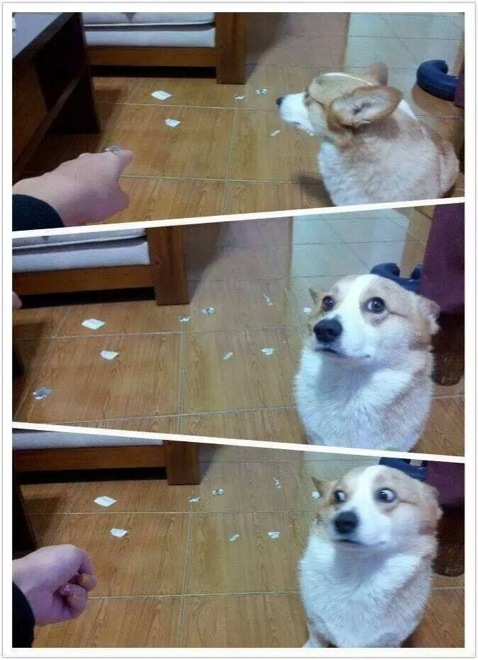 A dog’s face can very easily give away their guilt. It doesn’t help when they are standing directly in front of the mess they just created. But admit it, you stay mad for about 10 seconds and then you have to laugh at the situation standing before you.